Last night I started a basic dog drawing. I painted the eyes and nose, I wanted them to look as normal as possible, followed then by a variety of coloured washes over the different parts of his head. I then added this morning some random ink stencil patterns, in contrasting coloured distress inks by Tim holtz. Paint brush down, and left to dry, I went out for a lovely forest ride, for a little sunshine, and to get the dog out. Back home I finished off a few more inked patterns, and then added some shadows to give some more dimension, although I didn’t want it to look realistic, I wanted a little more depth. I am really happy with the end result, it is kind of what I had in my head, I am not sure if it should have had a background wash, or if white is ok? But I will leave it as it is for fear of ruining it. 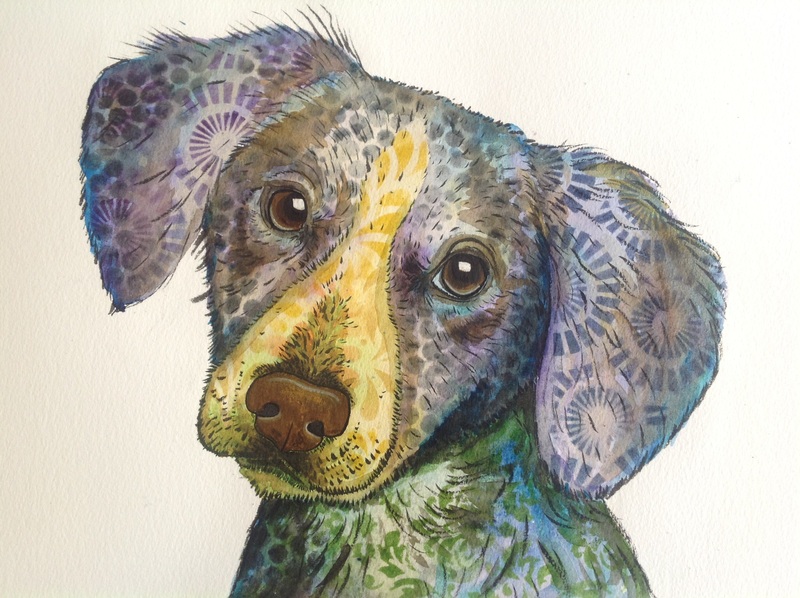 This entry was posted in abstract, art, Mixed media, watercolour and tagged abstract, art, Dog, Mixed media, painting, Painting, watercolour. Bookmark the permalink. I like the white with the patterns and textures going on in this animal. I would leave it. It’s beautiful! This is awesome, Rebecca! I have to say all of your abstracts do look a bit representational lol. They are wonderful though! I love the loose and free feeling because you don’t take it too far and it really is stunning! Yay, love that word “yet”!!! !